Tom Izzo was asked to describe the zone Adreian Payne was in on Thursday, when the Michigan State center made 27 of 32 shots taken and scored a school record for NCAA Tournament games with 41 points. "That wasn’t even in the ozone," Izzo said. "He was in Pluto and beyond. I mean, he was way out there." Pluto, once considered the ninth and most-distant planet from the sun before being reclassified into a trans-Neptunian object, is about as far out as you can get in the solar system. And that was the point of Izzo, the Michigan State coach whose student section is called the Izzone. Payne assured Delaware wouldn’t flirt with an upset by making 10-of-15 field goal attempts (missing just once on five three-pointers) and all 17 free throw attempts. He did all of this — along with adding eight rebounds, one blocked shot and one assist — in only 24 minutes. That approached scoring two points per minute. The scoring total eclipsed the 34 points All-American forward Greg Kelser scored against Notre Dame on March 18, 1979 with the Spartans en route to their first NCAA title. And it stood for 35 years until the angular Payne, a 6-foot-10 talent NBA teams are drooling over, put away a 93-78 win that advanced MSU to a Saturday game with Harvard. Three more wins must be had in order to reach the team’s goal of the Final Four in Arlington, Tex. The Blue Hens, led by pesky outside shooters Devon Saddler (21 points) and Davon Usher (20 points), were hanging with the Spartans midway through the first half. 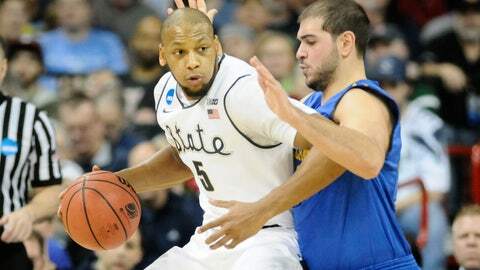 It was 24-18 for MSU until Payne hit the button for "Pluto and beyond" and quite simply could not miss. He drained a three-pointer from the top of the key and to the right. Then Payne quickly hit another trey from the top of the key and to the left. Next came a left-handed bank shot that he made and drew a foul on before converting an old-fashioned three-point play. Payne got back to the perimeter on the next possession, swishing a three-pointer from directly behind the basket. Payne took a breather, his team up comfortably now, 36-18. Was it like being in another world, he was asked? "Yeah, when you’re scoring like that and your game’s coming so easy to you," Payne said, "and you make a lot of shots, it feels like you’re in a rhythm. It feels like you can’t be stopped. I just wanted to continue to just thank the players and my coaches for being able to get me the ball in situations like that." Reserve guard Travis Trice, whose 19 points were second-most, said, "Any time you got a guy like A.P., who has a game like that, you just got to try and find him. And I think that’s what we did early on and it really helped open it up for everybody else." Not that anyone stepped up behind him until Trice did later in the game played in Spokane, Wash. Delaware went on an 11-0 run until Payne returned from his break after the three-point barrage. Payne then came back to hit a pair of free throws and another trey to make the lead comfortable once again. Nobody at MSU had ever been perfect on more than 10 free throws in an NCAA game, and Payne broke Earvin "Magic" Johnson’s records for the most free throws made (14) and attempted (15) in the tourney against LSU on March 16, 1979. Asked about setting records, Payne said, "I would say (that’s) leaving a legacy." Payne has now made all 29 free throws taken in NCAA games. And to think Payne, who has made 78 percent of his free throws this season, shot only .486 from the charity stripe as a freshman. He improved his scoring average by nearly one point in this game, going from 15.8 to 16.7. And only six players have ever scored more in one game for MSU than Payne’s 41, which tied for the 10th-highest total in one game. Terry Furlow’s 50 points against Iowa in 1976 is the record. Individual superlatives, however, aren’t what Payne is about. He’s focused on doing what Izzo wants from him, and that’s to establish his inside game before burning opponents from beyond the arc, where he has made good on 38 of 86 attempts for 44 percent. Izzo discussed a text Payne sent him after the final buzzer. "Adreian is not a guy that sends long texts," Izzo said. "He just talked about the things he learned and he wanted to finish strong. And it was kind of a deep text for him about how he’s going to just try to stay focused and do whatever I need him to do. Ironically, when he makes that decision, I think him and I work well together." Payne is sharing deep thoughts, hitting deep shots, and hoping to take the Spartans deep in this NCAA Tournament — all the way to the heart of Texas.